Gustavo Arellano’s Taco USA, reviewed. Taco USA reveals—and appreciates—how Americans co-opted tacos, tamales, tortilla chips, and tequila. When I was growing up in Austin, Texas, my family often followed Sunday-morning church service with a visit to a hole-in-the-wall Mexican restaurant in a strip mall off Interstate 35 for migas: eggs scrambled with peppers, onions, and tortilla chips, smothered with cheese and served with fresh tortillas. Weeknights when my dad worked late, my mom and sister and I stopped at Taco Cabana, a Texas drive-through chain, for soft tacos filled with roasted chicken, black beans, and pico de gallo. Birthdays meant fajitas in the dining room of the Austin Hyatt; really special occasions meant mole enchiladas at the upscale (by Austin standards) Fonda San Miguel. After we moved to a suburb of Washington, D.C., we were harsh judges of our new town’s Mexican offerings, invariably deeming them inferior to Austin’s (even D.C.’s disappointingly named Austin Grill). So we started making more Mexican food at home. Queso became my mom’s go-to potluck dish, enchiladas a weekend cooking project for me and my sister, frozen margaritas my parents’ favorite way of impressing guests. To the benefit of psychologists everywhere, people often don’t recognize the weirdness in their families’ idiosyncrasies until they’re already deeply ingrained. So I didn’t fully see the incongruity of a quartet of WASPs appointing themselves ambassadors of authentic Mexican food until I started reading Gustavo Arellano’s tasty but not-quite-satisfying Taco USA: How Mexican Food Conquered America. That’s because, as Arellano explains, what most of us think of as Mexican food was invented in America, and it has a long history of being co-opted by gabachos (as Mexicans actually call gringos). Chapter by chapter, Arellano painstakingly traces the paths of dishes—tamales, tacos, burritos, tortilla chips, tequila—and shows how they either were born in the United States or changed irreversibly after crossing the border. He unearths forgotten incarnations of Mexican food, like the stews made by San Antonio’s once-famous chili queens in the late 19th century. He also appraises unexpected ingredients—chocolate, I learned, was traditionally consumed by Mexicans as a foamy, unsweetened drink that I predict will be on espresso-bar menus across the nation within a couple of decades. The chili is an angry, dark red; flecks of beef sit around the spicy goop. It sings of San Antonio’s queens—not too sweet, not far removed from the cauldrons that gave palpitations to the original easterners who clamored over it, unctuous enough to trap a small animal. The heat of the plate and the steaming ingredients means that the queso coagulates over the cheese taco and assumes the consistency of Play-Doh. I’m all for creativity in food writing—God knows I don’t need to read another description of macaroni and cheese as “comfort food” —but reading that a dish is enraged, contains goop thick enough to drown a squirrel, and resembles children’s modeling clay does not make me want to eat it. The biggest problems with Taco USA, though, are problems of depth. Arellano has done a hell of a lot of reporting and unearthed some fascinating facts about Mexican food in America. But—with the exception of his evident disdain for Bayless and his ilk—he doesn’t say what he thinks about Mexican food’s assimilation into the mainstream, nor does he do much to situate his crispy taco shells in a broader cultural or political context. We see over and over that privileged whites profit from Mexican food while Mexicans are deprived of credit for their own creations, but Arellano doesn’t tell us the mechanisms by which this injustice occurs. (He rarely even utters the word racism—perhaps out of fear of alienating the portion of his audience that’s demographically more like my family than his.) The structure of his book doesn’t help—by organizing his chapters by dish rather than chronologically or by geographical region, Arellano makes it hard for readers to see how Mexican food—and Mexicans—changed in America over time. Arellano’s most powerful and complex anecdote comes in his introduction. He once publicly debated former Colorado Rep. Tom Tancredo, a hate-spewing xenophobe, over whether Mexican immigrants are capable of assimilating into American culture. Before the debate, the two opponents dined together at a Mexican restaurant across the street. Tancredo ordered tamales in green chile sauce and happily ate every bite on his plate. 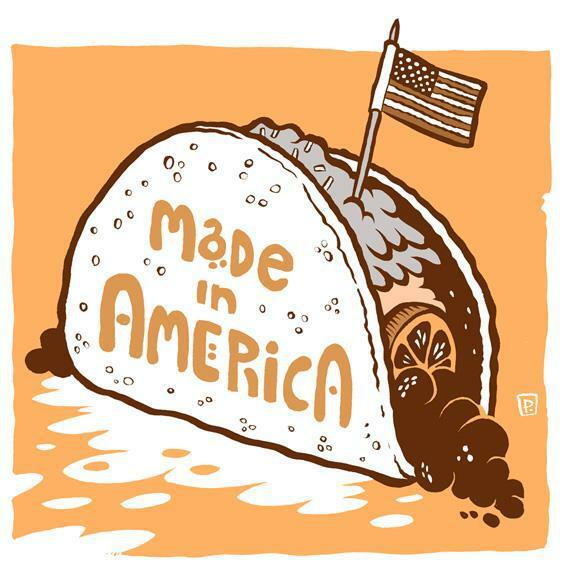 But Taco USA’s lack of context reflects the way many Americans, like me, are used to eating Mexican food: happily and thoughtlessly, with all that cheese short-circuiting our critical faculties. And the book still has a lot to offer. Arellano’s reporting may not be deep, but it’s broad, and he manages to squeeze in mentions of just about every Mexican restaurant (including, believe it or not, both Taco Cabana and the dining room of the Austin Hyatt), product line, and preparation in the country. If you’ve ever wondered about the roots of Taco Bell or why fajitas are called that or who invented the frozen-margarita machine, you’ll find answers here. If you’re bored of the Mexican options in your town, Arellano will offer you fresh ideas from the other side of the country—french-fry-stuffed burritos, anyone? And if you fancy yourself an ambassador of authentic Mexican food, Arellano will put you in your place right quick—but then he’ll join you there, because queso may not be authentic, but it sure is good.